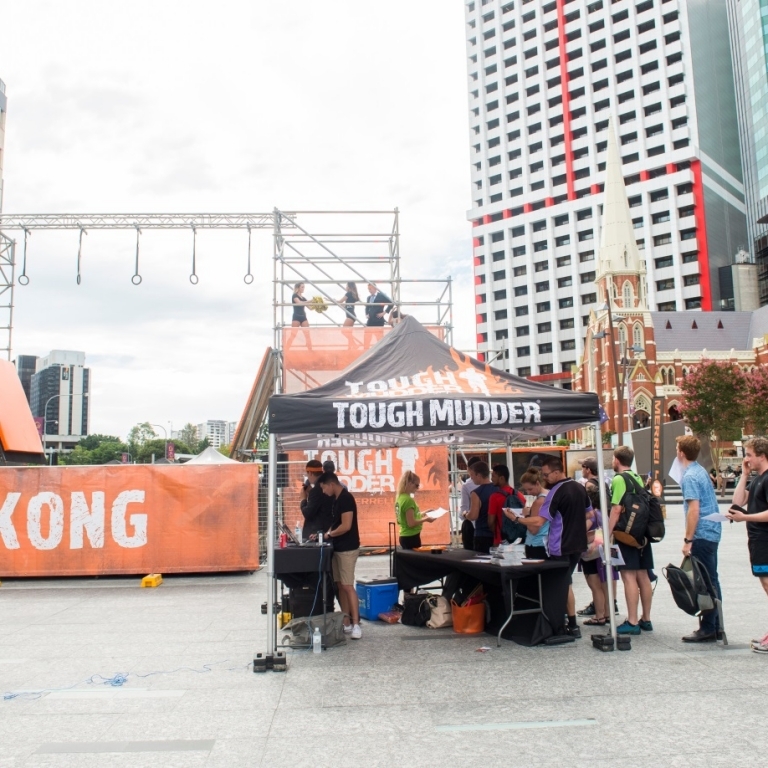 With only 70 days to go before the 2017 Tough Mudder Australia season kicks off in South East Queensland, the newest Tough Mudder obstacle, KONG hit Brisbane’s CBD to give workers and residents the opportunity to be the first to try the world class obstacle. 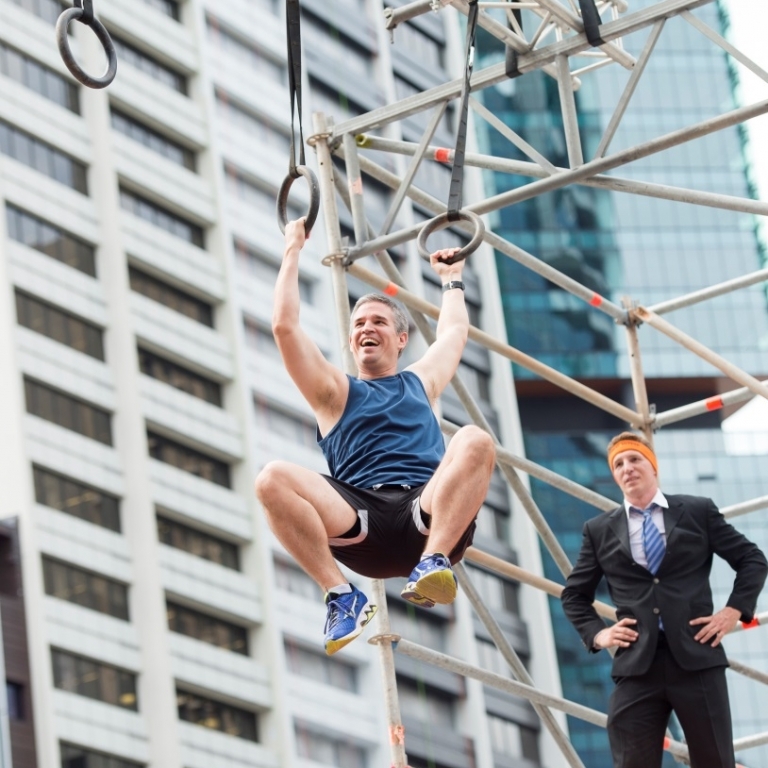 ‘Kong’ is a 30 foot high and 20 feet wide obstacle in which participants must traverse across dangling rings, or risk falling into a massive crash mat. 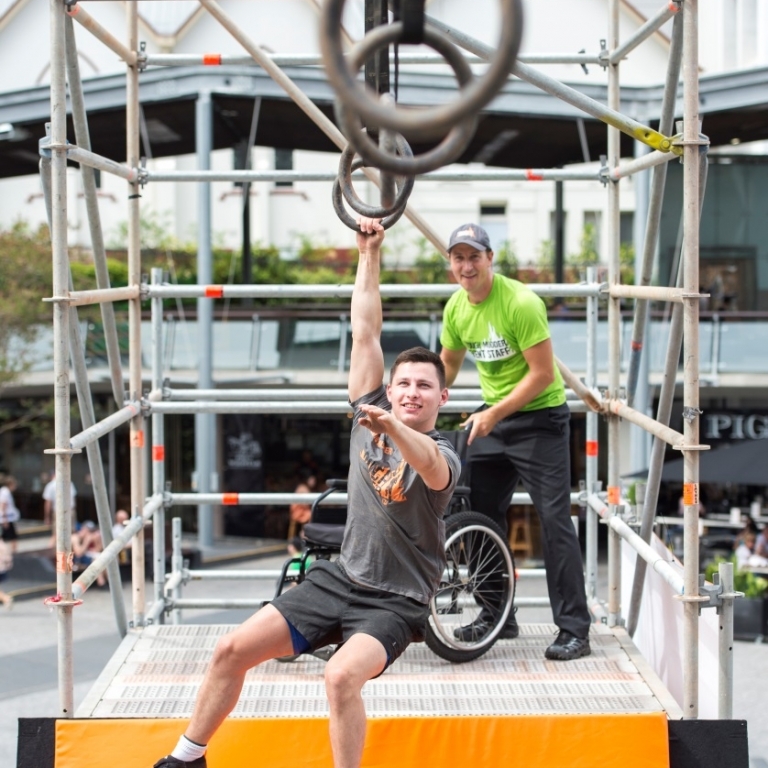 Locals saw it pop up at King George’s Square, giving them a sneak peek of what’s to come at the 18km Tough Mudder obstacle course in May. Tough Mudder is designed to test the toughest of Aussies, while encouraging teamwork and camaraderie above all else. With almost 50,000 mudders taking on the challenge in Queensland since its inception in Australia in 2013, this year’s event is set to be the muddiest and toughest yet. 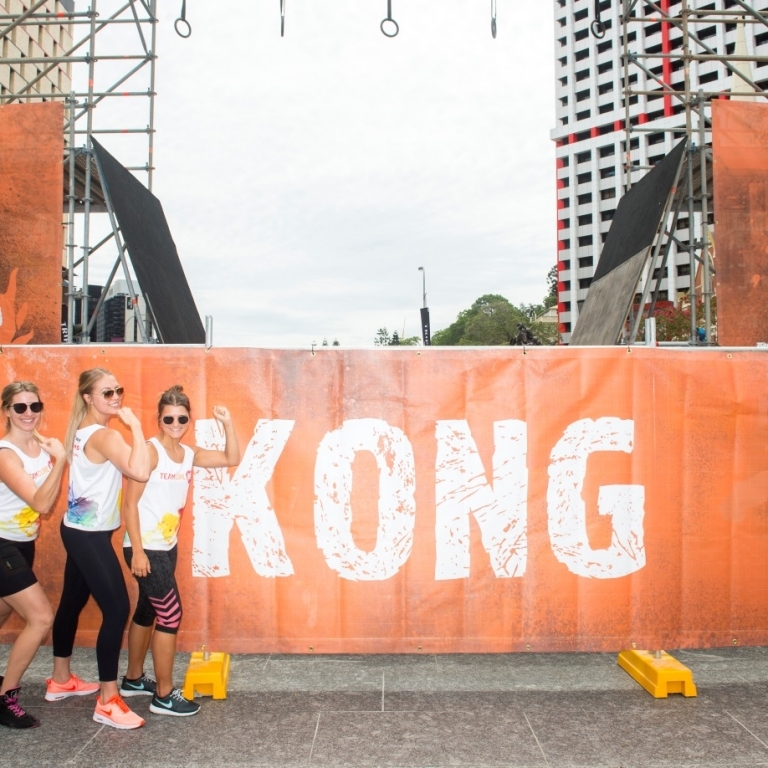 “Participants usually have to wait for the first event to see Tough Mudder’s obstacles so bringing KONG to the CBD certainly gave mudders in the city a small advantage when it comes to tackling the course in May this year,” said Paul Mudge, Partnerships & Marketing Director, Tough Mudder Australia. In an example of true grit and determination, Rye Shawcroft (aspiring Paralympian and former Australian soldier), was the first Aussie to tackle the new obstacle. Rye showed just what it takes to be a mudder, taking on Tough Mudder for the first time last year in a wheelchair. “I’m really excited to have Rye here with us today to be the first to take on this epic new obstacle in Australia. He really is an inspiration, proving that with determination, teamwork and hard work, you really can achieve anything,” said Mudge. Tough Mudder also confirmed the introduction of the Tough Mudder Half to the Queensland event for the first time. The new event series offers all the muddy fun and plenty of signature obstacles all on a 10km course. An accessible, yet rewarding challenge that requires less training, Tough Mudder Half excludes the extreme obstacle elements, like ice and electricity but still packs in plenty of thrills. This year’s events will also introduce a range of new and upgraded Tough Mudder obstacles that are guaranteed to make the hairs on the back of your neck stand up. They include: Augustus Gloop, Funky Monkey – the Revolution, Artic Enema – The Rebirth, and The Reach Around as well as a number of enhanced Legionnaire obstacles for the toughest of mudders.